The publisher knows eye-catching covers and kid-friendly designs will sell books. Short chapters keep pages turning. Illustrations throughout the text capture reluctant readers' attention. This book has clever appeal and continues to keep James Patterson on the best seller list; however, it is certainly not to be compared in the same category as Jeff Kinney's Wimpy Kid series. Rafe Khatchadorian is new to middle school. He can't figure out how to fit in until his friend Leo the Silent tells him to play a new game. Rafe decides to break every rule in the Hills Village Middle School Code of Conduct. Leo and Rafe create a point system: easy stuff gets small points-- like chewing gum in class only rates 5,00 points, but destruction of school property rates 35,000, and stealing school property gets 40,000 points. The boys decide that Rafe must break every rule or die trying. Rafe actually pulls off a few instances of rule breaking but gets detention with the Dragon Lady. Meanwhile, brutish bully Miller the Killer figures out what Rafe is up to and wants to stop him. On top of all his middle school shenanigans, Rafe has a dysfunctional home life. His mom works all the time at the diner while her live-in, no-good boyfriend "Bear" lies around all day sleeping and vegging out on the sofa watching t.v. Younger sister Georgia is mostly just annoying and tattles on Rafe's every move. Rafe ends up losing a friend, learning several lessons, making up with his mother, and ends up putting all his creativity to good use. His mother finally sees the light and makes decisions that affect the family. 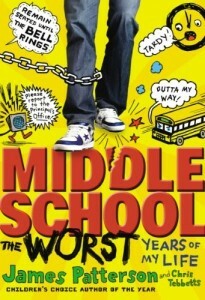 Recommended for ages 10-14 and middle school reluctant readers. Rafe Khatchadorian knows he will never fit into middles school until he decides to systematically break every rule in the school rule book, along with the encouragement of his silent friend Leonardo. His actions have funny consequences as he faces a bully both at home and at school and disappoints his hard-working mom until he finally realizes there are other ways to become popular at school. The short chapters are interspersed with lots of artwork that also tells part of the story.